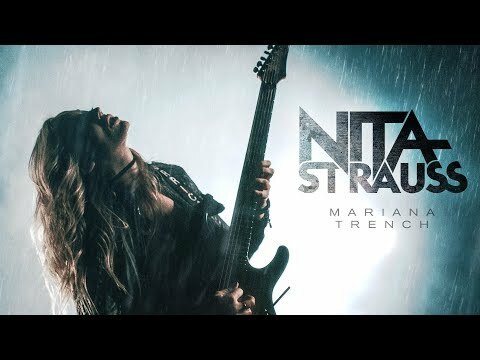 NITA STRAUSS - CONTROLLED CHAOS OUT NOW! Los Angeles born guitarist Nita Strauss has become a force to be reckoned with in the music world, dazzling audiences across the US, UK, Europe, South America, Asia, Australia and Africa. Most fans will recognize Nita as Alice Cooper's touring guitarist of the past 4 years, but she has also played with R&B star Jermaine Jackson, early MTV darlings Femme Fatale, video game supergroup Critical Hit and popular tribute band The Iron Maidens. Her skill, exuberant stage presence and love for all things about her instrument have earned her a stellar reputation in the music industry and endorsements including Ibanez Guitars, Marshall Amplification, DiMarzio pickups, Monster Energy and more. 2018 has been a banner year for Nita. In January she was officially announced as the first ever female Ibanez signature artist with her own model, the Ibanez JIVA. She also released her signature pickups, the DiMarzio Pandemonium. April saw Nita playing WWE Superstar Shinsuke Nakamura's entrance music at Wrestlemania in New Orleans in front of an audience of 78,000 fans and millions streaming worldwide, and in the same month she launched a wildly successful Kickstarter campaign for her debut solo record Controlled Chaos. The campaign reached its goal in two hours, doubled it by the end of the day, tripled the following day and ended up over 800% funded. Nita produced the record herself and did the majority of the engineering, as well as playing all the guitars and bass on the record. After the record was competed, Nita signed with Sumerian Records to release and distribute the album worldwide. After finishing out the Alice Cooper tour cycle, Nita will immediately hit the road supporting Controlled Chaos alongside modern guitar virtuoso Angel Vivaldi. Nita has been featured on the covers of many worldwide print magazines and on dozens of albums, trailers, and soundtracks, including Heroes Of The Storm (Blizzard) and Grammy-nominated Metal Gear Rising: Revengeance (Konami/ Platinum Games); and is the author of the Guitar World column "Like A Hurricane". Nita was also the official in-house guitarist for the LA KISS, the arena football team owned by Paul Stanley and Gene Simmons of KISS. She is one of the most sought after clinicians in the industry and has done extensive clinic tours across multiple continents. Her consistent touring schedule has shown her to play in front of over a million audience members per year consistently for the past several years. Nita is also extremely passionate about health and fitness, and uses her wide social media reach to inspire and educate people about maintaining a healthy lifestyle while traveling on tour. Nita's debut solo album Controlled Chaos will be available worldwide November 16 through Sumerian Records.